What is happening now? Not sure, but a number of people who love the Lake District have expressed an interest in what was happening there forty years ago today. On Friday 14th June Sophie Neville was interviewed by Mike Zeller on BBC Radio Cumbria’s Breakfast Programme at 7.20am and again at 8.50am. Hillary Warwick from Bolton-le-Sands near Carnforth rang in to say that her grandma owned the green parrot, telling us that he was called ‘Beauty’. They used the £25 appearance fee to buy him a new cage. Hilary’s gran, Elizabeth Proctor, had been quite a character. She’d walk around Kendal with Beauty on her shoulder. He was known to be a one-woman bird and Hilary was quite impressed that I managed to stroke him and keep him on my shoulder as he was liable to nip. She was quite wary of him! Do you live in the Lake District? Did you take part in the film in anyway? If so do write in using the comments box below! 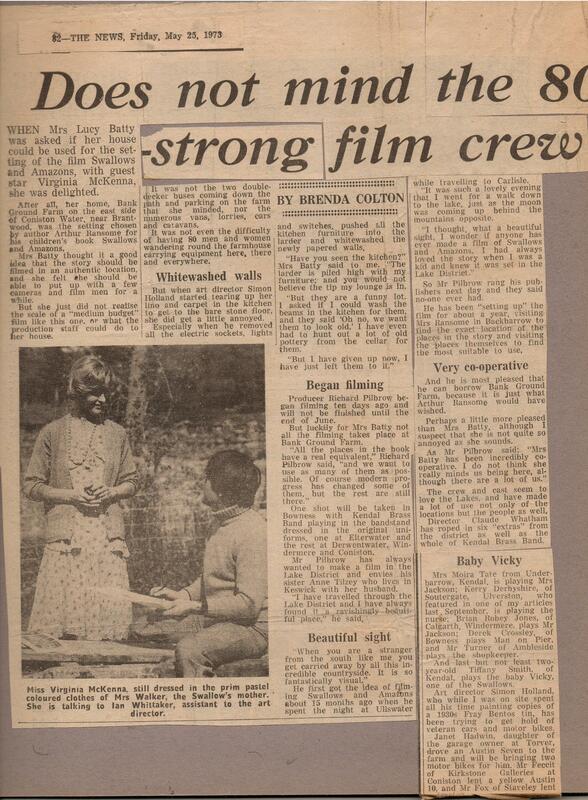 Here is another newspaper article from 1973 that mentions Lakeland people involved in the filming forty years ago, including a photograph of Mrs Lucy Batty and her grandson Peter and Margaret Causey who taught the children in the movie, pictured below with Lesley Bennett, Kit Seymour, Sten Grendon, Sophie Neville and Mark Hedges – who didn’t appear in the movie but came up over half-term as his Dad, Bob Hedges was working as the property master. Virginia McKenna is photographed above talking to Ian Whittaker, the set dresser who went on to win a number of Oscars. 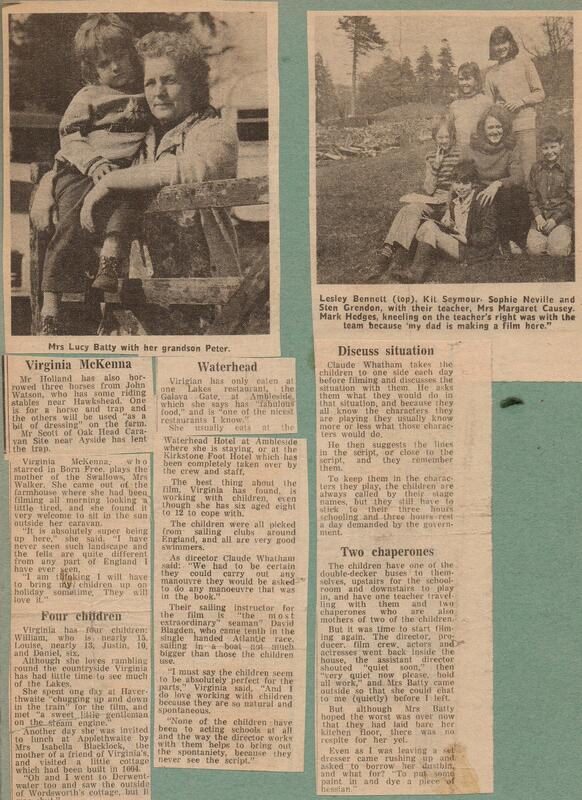 ‘When Mrs Lucy Batty was asked if her house could be used for the setting of the film Swallows and Amazons, with guest star Virginia McKenna, she was delighted. After all, her home, Bank Ground Farm on the east side of Coniston Water, near Brantwood, was the setting chosen by Arthur Ransome for his children’s book Swallows and Amazons. Mrs Batty thought it a good idea that the story should be filmed in an authentic location, and she felt she should be able to put up with a few cameras and film men for a while. But she just did not realise the scale of a “medium budget” film like this one, or what the production staff could do to her house. It was not the two double-decker buses coming down the path and parking on the farm that she minded, nor the numerous vans, lorries, cars and caravans. It was not even the difficulty of having 80 men and women wandering round the farmhouse carrying equipment here, there and everywhere. But when art director Simon Holland started tearing up her lino and carpet in the kitchen to get to the bare stone floor, she did get a little annoyed. Especially when he removed all the electric sockets, lights and switches, pushed all the kitchen furniture into the larder and whitewashed the newly papered walls. “Have you seen the kitchen?” Mrs Batty said to me. “The larder is piled high with my furniture; and you would not believe the tip my lounge is in. But they are a funny lot. I asked if I could wash the beams in the kitchen for them, and they said ‘Oh no, we want them to look old.’ I have even had to hunt out a lot of old pottery from the cellar for them. Bank Ground Farm is very much smarter today ~ Click here for their website.